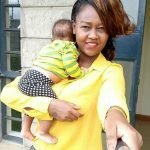 Nana Owiti, King Kaka´s wife experienced high blood pressure during her second pregnancy, yet she was not aware. It was until she got tested in hospital, that things weren´t good. Likewise, she earlier on shared her miscarriage experience; without knowledge that she was actually carrying a dead foetus in her womb back in 2014. The post Sad:¨5 days after, I developed Oedema¨! King Kaka´s wife narrates traumatizing experiences hospitals take postpartum mothers through appeared first on Ghafla! Kenya.